MidCoast Fine Arts’ Riverssance Festival of Fine Art is celebrating its 32nd year as the premier fine arts festival of the Quad Cities, showcasing 100 of the top artists throughout North America—artists like you! We’re proud of our reputation of treating artists like friends. We provide easy access onto the park for booth set up, “art angels” for booth breaks, lunch order delivery, complimentary water, commemorative festival t-shirt, AND we buy ART! 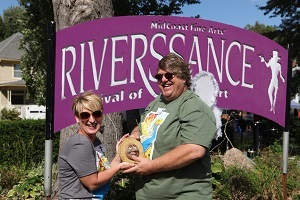 Organized and run by art enthusiasts, Riverssance continues to be recognized for its careful attention to artists’ success, community partnerships, great buyers, beautiful location, and a fun weekend. 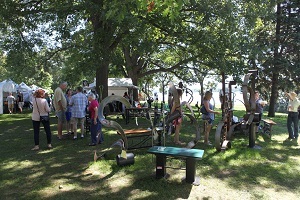 Your artwork sales will be complemented by regional stage entertainment, a children’s art tent, quality food vendors, and regional wine tasting. Saturday, Sept. 21, 2019, 10 a.m. - 5 p.m.
Sunday, Sept. 22, 2019, 10 a.m. - 4 p.m.
Lindsay Park in the Village of East Davenport, Iowa, on a scenic bluff overlooking the mighty Mississippi. All artwork must be original and created by the artist. Limited edition prints are permitted but must be clearly marked as a reproduction. Commercial exhibits, buy-and-sell items, items made from kits and commercially molded articles are not permitted. Any commercially produced materials used to complete exhibited work MUST be subordinate to the original artistic interpretation and technique of the exhibited art. Artists may apply in additional categories, with a separate application, jury fee and images for each one (e.g. jewelry and sculpture or painting and wood). The Riverssance Festival Committee reserves the right to request the removal of any work that differs from these criteria or from the images submitted. Failure to comply will result in the removal of the booth from the Festival, without refund. o Ceramics: Original shaped and fired clay (including earthenware, porcelain, stoneware and terracotta). o Fiber: Original work created by the artist from fibers/fabric or leather including batik, basketry, weaving, and quilt-making. No factory produced items are permitted. o Glass: Original work created in glass by the artist including blown glass, fused glass or stained glass. o Jewelry: Original work created through fabrication and/or original casting by the artist. o Mixed Media: Includes collage and handmade paper; incorporates more than one type of material. o Pastels: Dry pigments applied to a surface. o Photography: Black & white, color, black and white & color, hand color, digital. o Oils: Applied to a surface in any way. o Sculpture: Three-dimensional art that serves an aesthetic or functional purpose. o Wood: Original hand-tooled, machine worked, built-up, turned or carved work. o Other: If your category is not represented, you may add your own. Artists must supply all necessary display equipment. All canopies are required to be white and able to withstand winds and rain and be properly weighted. Each exhibitor will be assigned a 12-x12-foot area. Displays must conform to space allotted. All artists are responsible for paying Iowa sales tax. Artists are required to display during all public event hours on both days. There is no rain date. Come prepared for inclement weather. Riverssance, MidCoast Fine Arts, or any community partners or sponsors are not responsible or liable for the loss or damage of property or display. The Riverssance Committee will make every effort to give accepted artists requested spaces, contingent on the layout of the festival. There are a limited number of corner booths. These and other requests will be given to the earliest emailed or postmarked requests. Artists may set up after 1 p.m. on Friday, September 20, and must be set up by 10 a.m. on Saturday, September 21. No electricity is supplied to artists’ booths. Checks and a special set of trophies designed by one of our regional master artisans will be awarded Sunday morning. A reception for participating artists (and their supporting booth attendants) will take place directly after public hours Saturday evening. The annual Harley Award for Outstanding Community Art Support will be presented during the reception for the selected recipient. Jurying for acceptance will be made from five digital images uploaded by the artist to Juried Art Services. Each artist will supply four images of work executed in the last three years and one image of the display. The work will be juried based upon originality, technical skill/mastery of materials, design/vision, and cohesiveness. Acceptance will be based on total jury scores; however, additional consideration will be given to categories that would otherwise exceed 20% of the booth allocations. Applications will be processed online through Juried Art Services (JAS) at www.juriedartservices.com. Juried Art Services is free to participating artists and includes a detailed introductory tutorial. Please follow the steps to complete the application. 1. Include four images of your work and one of your booth. Your artist statement should describe the process and materials. Limit of 1,000 characters including punctuation and spaces. Artists should not include their name in the artist statement or booth image. 2. Recommended image format is no smaller than 1400 px and no larger than 4000 px. 3. Pay the application fee by clicking Pay Now. 4. After completing the application and paying the fee, either mail a check payable to MidCoast Fine Arts for $175 (booth fee) or pay online at https://www.midcoast.org/call-for-entry. Applicants who have not submitted the booth fee will not be included in the jury. Checks will not be cashed until you have been accepted as an exhibitor. Mail booth fee checks to Riverssance c/o Jodean Meleski, 1112 30th St., Rock Island, IL 61201. 5. Contact support@jurying.net if you need assistance with your application. Artists not selected by the jury for this year’s Riverssance will have their booth fee refunded after March 4, 2019. An Artist Statement describing the technique, materials, and processes used in the creation of your entire body of work must be included with your application. For any cancellation sent in writing or by email prior to August 17, booth fees will be refunded (less $25 administration fee). After that date, there are no refunds. September 20 - Friday booth setup AFTER 1 p.m.
September 21 - 31st Annual Riverssance 10 a.m. to 5 p.m.
September 22 - 31st Annual Riverssance 10 a.m. to 4 p.m.
Artists may leave displays overnight Friday and Saturday at their own risk. Security will be provided both nights, but loss and damage are the responsibility of the artist. Mid­Coast Fine Arts is a lead­ing non­profit 501c3 orga­ni­za­tion stim­u­lat­ing our community’s cul­tural and eco­nomic vital­ity through the sup­port of regional visual arts and artists. In other words, we’re artists sup­port­ing artists by hav­ing amaz­ing art-focused events that make the Quad Cities a bet­ter place to live. MidCoast Fine Arts programs are partially supported by grants from the City of Davenport, Quad City Arts Dollar$ provided by the Illinois Arts Council Agency and John Deere, the Regional Development Authority and Scott County Regional Authority. I accept the rules and regulations regarding my participation in the 2019 Riverssance Festival of Fine Art. I agree to bear all risk and responsibility for any loss, theft, or damage to my artwork and/or personal property despite cause, and to abide by all rules and regulations set by the Riverssance Festival of Fine Art and its agents.